and their lessons reflected these skills. PARANA, J., WEST, A., JOHNSON-GENTILE, K. & LONBERGER, R. (2000). Preparing Preservice Teachers for the Technological Classroom: A School—College Partnership 1. 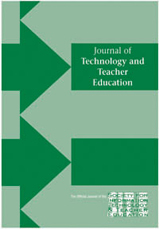 Journal of Technology and Teacher Education, 8 (2), 97-109. Charlottesville, VA: Society for Information Technology & Teacher Education. Retrieved April 26, 2019 from https://www.learntechlib.org/primary/p/8029/. Carnegie Forum on Education and the Economy. (1986). A nation prepared: Teachers for the 21 s t century, NY: Author. Holmes Group. (1995). Tomorrow ’s schools of education. East Lansing , MI: Author. Holmes Group. (1986). Tomorrow ’s teachers. East Lans ing, MI: Author. Novak, D.I. , & Berger, C.F. (1991). Integrating technology into preservice education: Michigan ’s Response. Computers in the schools, 8(1 /2 /3) , 89-10.